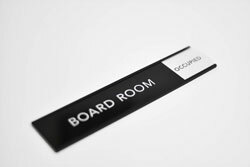 Sliding message signs to display availability - Label the meeting and conference rooms in your building with these 8"W x 2"H or 10"W x 2"H aluminum BOARD ROOM sliding availability signs. The metal frame is an anodized aluminum and includes a stationary metal back plate with a top sliding plate that will cover one message at a time. 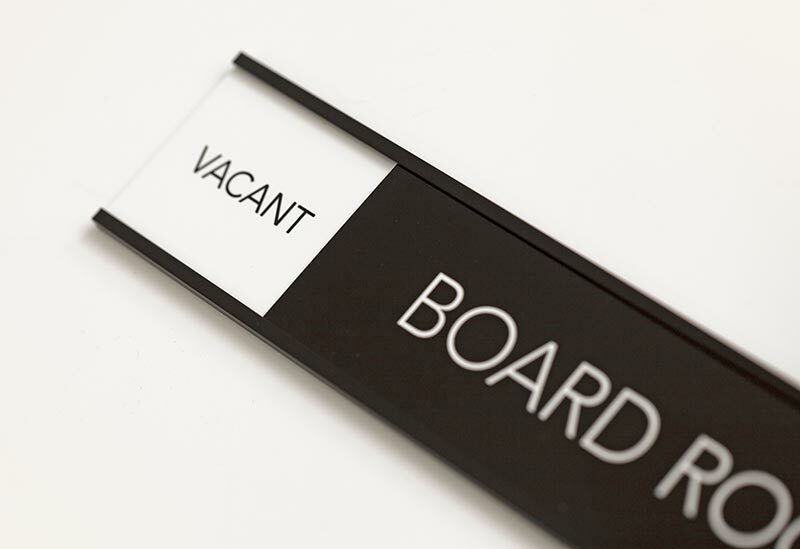 Standard sign includes left and right tabs that are white metal with black text reading VACANT on left and OCCUPIED on the right. 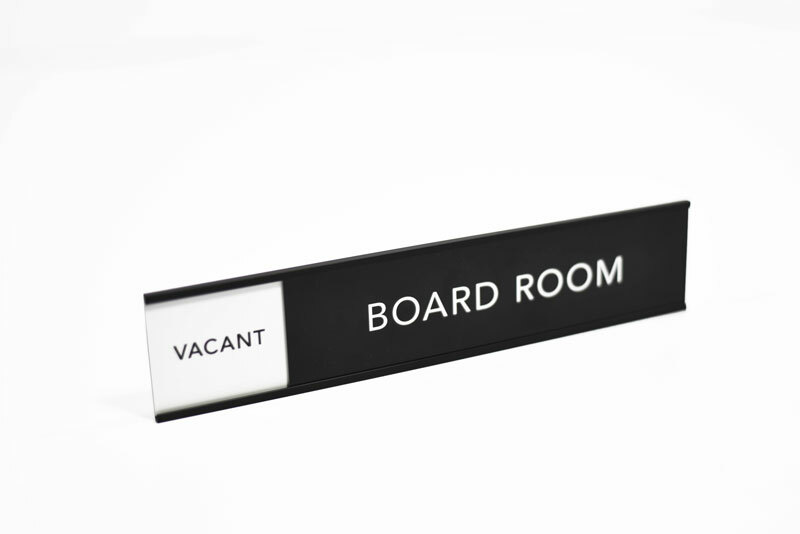 The top sliding plate is black with white text and reads BOARD ROOM. Include custom text when ordering if you prefer to create your own. Post these outside designated meeting rooms in your clinic, hospital, corporate office building or university to show availability of the space. If you require a size or style not listed here, please contact us at (701) 526-3835 or service@officesigncompany.com with all of your details or layout instructions.We have a talented team of layout artists on staff who would be happy to send you a digital proof. Please Note: due to the nature of our Brushed Silver Aluminum, no two batches are identical. If you plan on interchanging inserts frequently, you may find your new brushed silver inserts do not perfectly match your existing inserts. We recommend choosing a different color of aluminum if this is concerning to you. Please contact our customer service team with any questions! Personalize your sign. Indicate line breaks using slashes (/). Standard text reads "BOARD ROOM" in ALL CAPS. 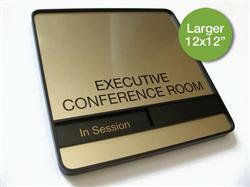 10" wide x 2" high sliding office and conference room signs. Display the availability of any employee or room name. Metal frames and nameplates with open frame slider design. 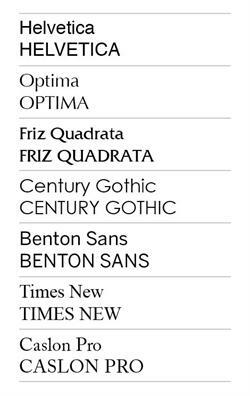 Free text personalization at no extra charge. Available in 12"W x 3" size. 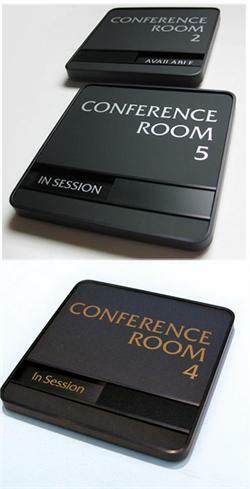 6" x 6" or 8" x 8" conference room sign with sliding "IN SESSION / AVAILABLE" tabs. 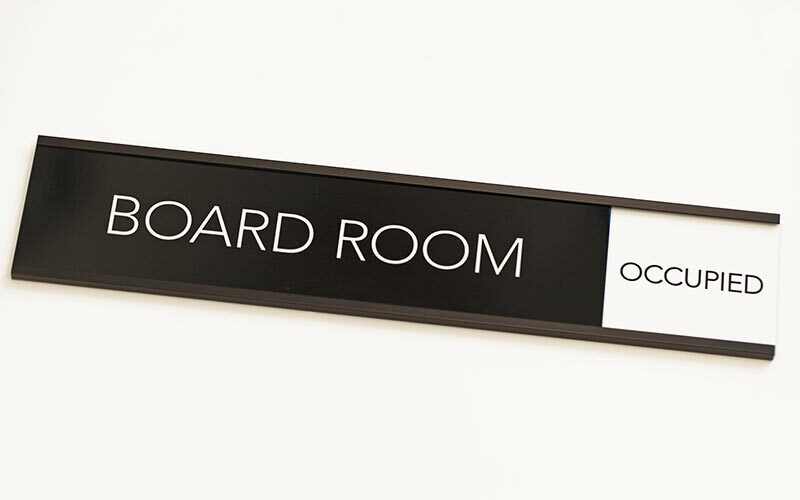 Custom text appropriate for your board room or meeting space. Choose mounting option for easy installation (wall, door, glass). Framed in black architectural metal. 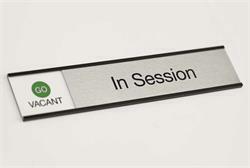 10" or 8" wide x 2" high silver on silver sliding office door signs and conference room signs. 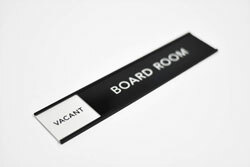 Display the availability of any employee or room name. 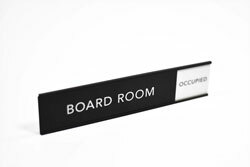 Metal frames and nameplates with open frame slider design. 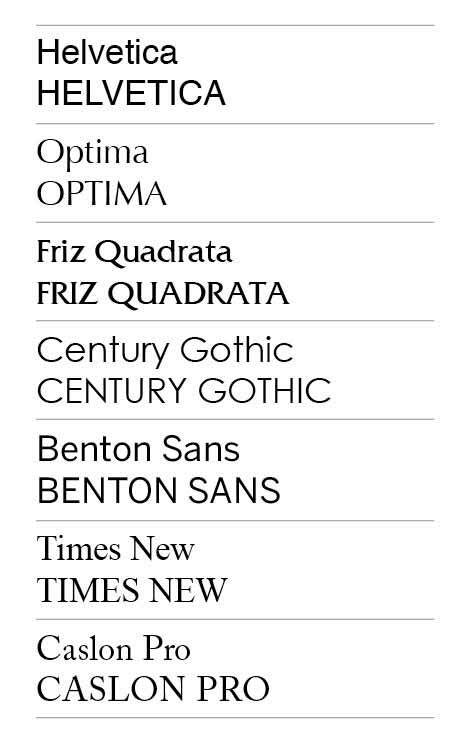 Free text personalization at no extra charge. 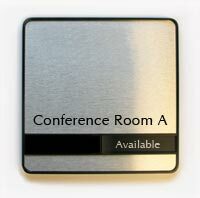 12" x 12" Conference room sign with sliding "In Session/Available" tab. 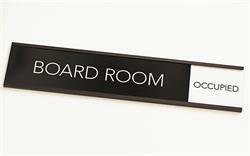 Custom Text appropriate for your board room or meeting space. Large conference room sign size ideal for hotels and larger facilities. Framed in black architectural metal. In Session sliding availability signs with full color stop and go graphics are a great way to show availability of conference rooms, board rooms, and meeting rooms in your medical facility or corporate office. 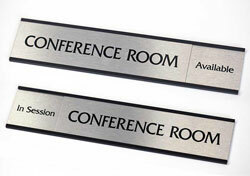 Sliding signs for work and office.